Cassa Pancho founded Ballet Black in 2001 to provide a solo platform for black and Asian dancers in an era where mainstream recognition is still sadly lacking. Surviving on a shoestring with just a little support from the Royal Opera House the award winning company aims to bring ballet to a more culturally diverse audience. It also offers community driven classes for dancers and students of all ages. Even more remarkable for a small company of eight is the ethos of commissioning new short works by both established and fledgling choreographers, extended in recent years to include narrative ballet. Lots of things can increase our brain dopamine levels and make us feel good, attraction, love and lust included. Ludovic Ondiviela explores this to the full in the sparkling duet Dopamine (you make my levels go silly) danced enticingly by a flirtatious Sayaka Ichikawa aiming to get her wary man, José Alves. Fabio D’andrea’s Perpetuum sets the pace for this whirlwind romance, executed with fast hand movements and climactic lifts, interposed with gauche shuffles and shy grins. The One Played Twice is Javier de Frutos intriguing response to music from the Pacific. Hawaiian barbershop songs suggest the motifs and dance conveys the mood. The rich music can overwhelm and even become intrusive. Frutos counters this by choreographing the linking silences, where suddenly dance tellingly takes centre stage again, forcing us to watch closely. 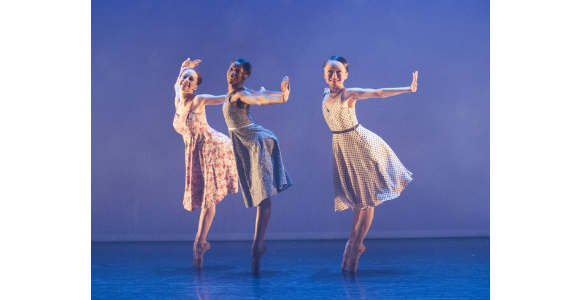 Clever partnering of senior and junior dancers works well in ensemble, (Isabel Coracy Damien Johnson, Christopher Renfurm, Cira Robinson) and the girls captivate in solos rooted to the spot with expressive upper body movements. Egal by Robert Binet explores the impossible ideal of a relationship that is totally equal in every sense and ability. Severely identically clad protagonists (Kanika Carr Jacob Wye), dance this demanding duet with ability, showing harsh emotional tension as each tests out the other without giving ground. The nostalgic War Letters by Christopher Marney rounds off the programme. Opening with a reading from a wartime letter from the Front it is a series of episodes reflecting on the emotional impacts of war which the company as soldiers and wives endure. Shostakovitch underpins the tension and Glen Miller the distractions of the era. There’s recklessness in the dance hall conga where death is just out of sight and poignancy in the bereaved wife seeking comfort. Most telling of all is the barely surviving man and his wife’s slow realisation of the truth. It could happen in any period; it is now. Reviewed on 11th October and touring.